The feel-good summer track hears Breezy lend his vocals to the chorus, singing; "If you're waiting for the moment, here it is/ If you're aiming for the heart than you can't miss/ You wanna know where's the love? Here it is." 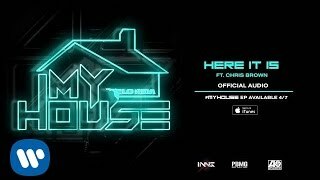 The song will live alongside the Robin Thicke assisted 'I Don't Like It, I Love It' and 'GFFR' featuring Sage The Gemini on Flo Rida's 'My House' EP, dropping on Tuesday. Listen to Flo Rida Feat. Chris Brown - 'Here It Is' above.